Growing up in China, Calvin Liang was ordered to work on a farm when he graduated from high school, but kept up his obvious talent of drawing and painting. He later had a job painting sets at the Canton Opera, and then studied at the Shanghai Academy of Fine Arts. In 1987, he left China for San Francisco where he worked at menial jobs and saved enough money to buy oil paints and other supplies. He also painted cartoons for Marine World and worked as a sidewalk portraitist. He joined the Artist Guild of San Francisco and exhibited with them. 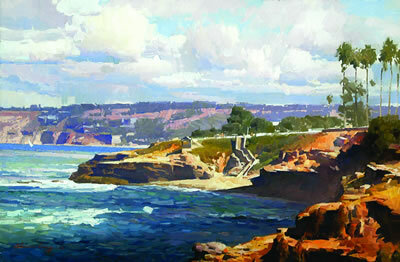 He is a member of the Plein-Air Painters Association, the California Art Club, the Laguna Plein Air Painters Association, and the Oil Painters of America. Liang’s awards include the Oil Painters of America Award of Excellence, first place award at the Golden Years exhibit at the Bowers Museum in Santa Ana, and Best of Show at the American Impressionist Society National Juried Exhibition.